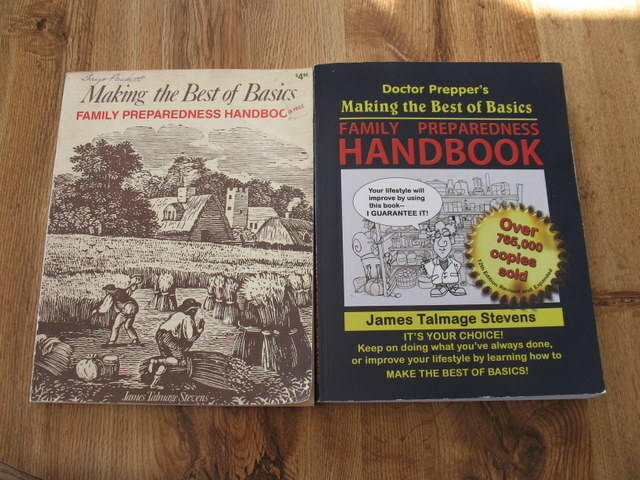 I recently got a copy of James Talmage Stevens’ bestselling book Making the Best of Basics: Family Preparedness Handbook–a fairly thorough guide to basic preparedness. For a little background, let me tell you this–Mr. Stevens has been publishing this book since shortly after I was born. The guy has been around preparedness a little bit. He’s had children at home, grand kids, and now is in the “senior citizen” stage, and he’s lived the preparedness lifestyle through it all so has some really good insight no matter what your situation may be. Now I know what you’re thinking–a lot has changed since 1974 in the preparedness world. It’s not all wheat and beans and powdered milk anymore! So let me assure you, this isn’t the same book it was when it was first published. In fact, I have a copy of the 1979 printing from grandma’s house–my mom has this same version, so I can really say it’s not the same book anymore. Both the old and new editions focus on basics of preparedness. Mr. Talmage really stresses living more self reliant rather than preparing for an end of the world situation with zombies and the like, but the information can be used in either situation. Here are the two versions next to each other. You can see the volume of the new one compared to the old version–and the new one is printed on a bit thinner paper! This is not a “doom and gloom” book, but a book of information to help you live a more self reliant lifestyle and get better prepared for whatever may come. The information contained in the new Basics is greatly expanded over the information in the old one. Mr. Stevens has included most of the information from the old edition (updating and expanding as things have changed over the years) and added some new sections to the newest edition. Overall, this is a very well put together book covering most of the preparedness topics you’ll want to consider when starting your preparedness journey. It even has enough information to be helpful for those of us who have been at it for a while. Because this book covers a variety of topics, some don’t go into great depth. So if you want more information on essential oils or herbs or cooking with powdered milk for example, you’ll want to get another resource for those. You definitely get enough information in this book to do a lot before wanting to buy another book. Making the Best of Basics includes a number of lists for things like food storage items, problems with storing foods, what to have in an emergency pack, online and other resources to check out, and other books the author recommends on a variety of preparedness topics. There are also preparedness charts and worksheets. One helps calculate the food storage amounts you’ll want to store for your family depending on what family members you are storing for. Others help in inventorying your home and financial records. You’ll probably want to photocopy these pages before filling them out as the information will change over time and you’ll likely want to update it at some future point. There are sections for cooking with basic food storage foods like wheat, powdered milk, sourdough, honey, and game meats. There is even a short section on cooking with white flour. The food sections include instruction, information, and recipes. There are also chapters on personal health including vitamins, herbs, and essential oils. For food preservation, he has a chapter on dehydrating but nothing on canning or freezing. Get the Ball Blue Book for canning and freezing. 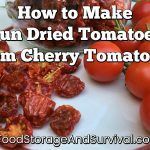 I’m thinking the reason he focuses on dehydrating is that dehydrating can be accomplished without power (and your food will keep without power also–unlike freezing) and requires fewer specialty supplies than canning. He also discusses pickling, corning, and making jerky in the game meats chapter. For fresh foods, there is a section on sprouting, but nothing on gardening since hey, gardening takes a long time and sprouts provide fresh nutrition in a couple of days. 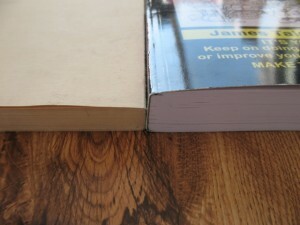 Other sections in the book cover fuel types and storage as well as the basics of precious metals. Besides gardening, canning and freezing, there are also no sections on firearms or other weapons. So if you’re looking for that kind of information, you’ll need a supplement to this book. Even though this book has been around a while, Mr. Stevens has kept it up to date and there is a great deal of help and direction for preparedness and living a more self reliant life in his newest edition of Making the Best of Basics. Even if you have an older copy from grandma, it’s worth updating. He’s even “in” enough to have a digital download copy available if you’re wanting to have the information on the computer instead of in print. This book is definitely recommended. The new version even…. then will see if I need to buy it also! Yep, It’s usually worth checking into a book at the library before putting out cash on it. Nice that it’s available for you! I have the older version and have found it to be a great resource. Angela: thanks for the kind words! Basics… was always about family preparedness. It was written to help families become prepared and to live a preparedness lifestyle, driven by spirituality, conducted as peaceful and prudent way to live, and to help families become prosperous through knowledge and wisdom. By the way, the book is available in a digital download–our immediate “no-wait/no-freight” package, and now in a CD-Rom version. We have some great information bonuses to add even more value to Basics…. I have now added to the mix the PreparednessRadioNetwork.com and BePreparedRadio.com website–and of course, DoctorPrepper.com. Why don’t we get you on my Doctor Prepper Talk Radio for an interview? Send me your phone number at Doc@DoctorPrepper.com and I’ll call you at my expense. I look forward to hearing from you. Thanks again for all you do help people get prepared for the uncertainty of the future!